"John McCormack found extraordinary success as a concert hall artist, being declared in 1918 ‘the most popular singer in the world’ and at one stage selling more records than Caruso. 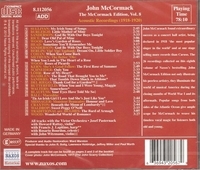 The 26 recordings collected on this eighth volume of Naxos’ bestselling John McCormack Edition not only illustrate his peerless artistry, they illuminate the world of musical America during the closing months of World War I and its aftermath. Popular songs from both sides of the Atlantic Ocean give ample scope for McCormack to weave his timeless vocal magic for listeners both old and young.